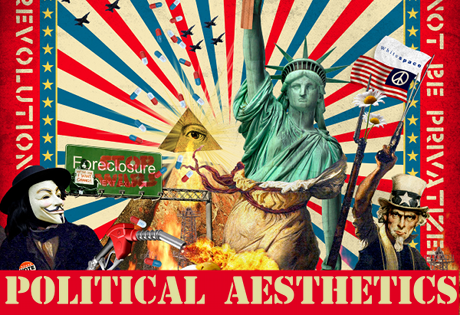 This article is part of an occasional series on ‘The Political Aesthetics of Power and Protest,’ the subject of a one-day workshop held at the University of Warwick in September, 2012. Democracy, since it does not function through command or coercion, requires instead a constant renewal of sets of symbols - symbols which appeal to people and instill in them a sense of belonging and identification. Increasing disenchantment and disillusion with the state, with political institutions, their practices and performance, makes it more important to explore the place of this aestheticisation of political language, the aesthetics of protest as well as of power. My analysis is based primarily on archival data and consulting the minutes of the British Museum Trustees’ meetings from 1753 through 1830 as well as the full record of the Select Committee on the Earl of Elgin's Collection of Sculptured Marbles (March 25, 1816). Then there are the newspapers. With the help of two digital search engines, I have located more than 1,000 articles from early nineteenth century UK newspapers and magazines that mention the sculptures or Lord Elgin. These proved to be rich repositories of information about how people outside of London and its elite art circles made sense of the sculptures and gradually accepted them as emblems of Britishness. Lord Elgin saw things differently. As ambassador to the Ottoman court, Thomas Bruce, the seventh Earl of Elgin, visited Athens, then under Ottoman rule. Elgin decided that the sculptures would be removed from the Parthenon and shipped back to the United Kingdom. In spite of his later claim that he acted in order to bring ancient Greek art to the British public and protect the sculptures from further damage, it is clear from Elgin’s private letters that he intended to send them to his home in Scotland. Beginning in the summer of 1801, Elgin's workmen pried or chiselled away a large number of marble figures. Some were heavily damaged or irreparably shattered. The work was finished the following year. It was not until 1804, after one ship carrying several of the sculptures sank and had to be recovered, that the major portion of them arrived in England. The shed was now the talk of the town. Anybody who was anybody in London’s cultural scene wanted to visit. In July 1808 Elgin staged his best show yet. His guests were now treated to the spectacle of three pairs of pugilists sparring among the marbles. These were no ordinary fighters. John Gully was a successful prizefighter and immensely popular figure. He retired from boxing in 1808, amassed a fortune, and became a Member of Parliament by 1832. John Jackson was the prize-fighting champion of Britain and Lord Byron's personal trainer. He was one of a small group of fighters invited to stand as pages at the entrance of Westminster Abbey during the coronation of George IV. Jem Belcher was a bare-knuckle fighter and Champion of All England from 1800 to 1805. In sum, these men were more than celebrity athletes: they were national heroes, lionized as icons. Dutch Sam, nicknamed the Man with the Iron Hand, was especially praised for his body’s symmetry with the ideal Greek physique. 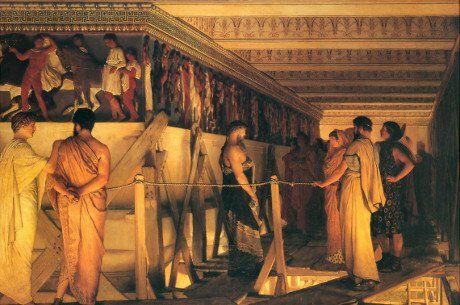 A well-known 19th century painting of an imagined visit to the Parthenon by Pheidias and his friends nicely showing the vivid colours of the sculpture. Wikimedia/Public domain.